Shannon wins big after long hiatus! You’ve probably seen Shannon Cagle in the cycling studio teaching Pedal and Praise, but she’s adding a new workout to her regimen. Making a comeback after 28 years, Shannon has thrown a swim cap and goggles into her gym bag. Attending the University of New Mexico on a swimming scholarship, Shannon graduated and went on to real-life adulthood with a career and a family. Seven months ago, after twenty-eight years out of the pool, she decided to get her feet wet again and resumed doing something she had loved. Of course, Shannon’s athleticism was easily awoken . 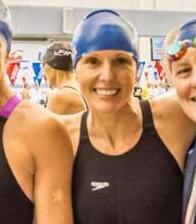 . . she quickly made national cuts in five events for Masters (40 and older), and was added to a relay team. In April Shannon traveled with the team to Greensboro, NC, where she scored in the top ten Masters in the nation in the 1000m freestyle, 100m freestyle, and 200m freestyle. The relay team came in 3rd nationwide in the 200m freestyle relay, breaking the state record by six seconds. Despite the thrill of such a great accomplishment, perhaps the most inspiring moment of the weekend for Shannon was watching the seniors swim. In awe of the 80- and 90-year olds that participated, Shannon was amazed at their dedication and perseverance. We know that will be you, Shannon . . keep up the great work – you’re making us proud! IS ONE MINUTE REALLY ALL YOU NEED?